The Duchess of Cambridge has been delivered of a son. Why not "The Duchess of Cambridge gave birth to a son" or "delivered a baby", or something along those lines? Why is "of" used in this structure, and what purpose does it serve? From a non-native English speaker's perspective, this sentence doesn't seem to make any sense at all to me. †2. a. To free, rid, divest, clear (a) of, (b) from. The language is formal, and perhaps a little archaic. When talking about birth, to deliver does not (originally) mean to bring, like "the stork delivered the baby to us" or "UPS delivered the baby". Rather, it means to relieve (somebody of something) as in "deliver us!" or "seeking deliverance". So, the unborn baby is seen as a burden the mother has been carrying, and at birth she is relieved of, or delivered of, the baby. In colloquial usage, this has changed, and people usually just say "the doctor delivered a baby" (active instead of passive voice), which fits well with the other meaning (as in delivering a package). As others said, I guess the archaic version has been used deliberately to make it sound more royal. Actually the answer is much simpler than those already provided. The mother is not the one doing the "delivering", that is the doctor. 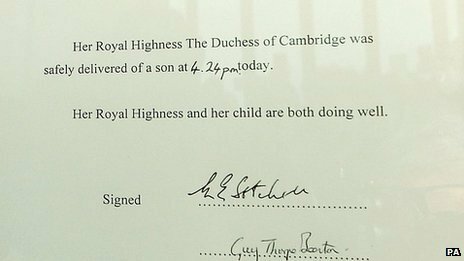 So the doctor delivered the baby and the Duchess was "delivered of" the baby. My sense of this kind of locution (and I hope my English cousins will forgive my presumption in speaking on their behalf) is that it is primarily a regal euphemistic mode. A royal personage should not be considered to have done something as "common" and "crude" (please note the quotation marks) as delivering a baby. It must be elevated to the level of "being delivered of," as if the process were somehow performed magically by the mother's royal status itself. On a more generic and broadly applicable note, pregnancy and giving birth have long been referred to euphemistically even for non-royals. The reasons for this are recorded historically, and I won't go into them, save to say that (as reprehensible as we find these negative attitudes now) these natural and beautiful things have been regarded with shame, embarrassment, and worse. As one example, here's a very old medical term which even now is the abbreviation we still use, EDC, meaning anticipated date of birth. But what does it stand for? "Expected date of confinement." What a weird and subtly negative euphemism! I am not sure about the real reason, but I know that many english syntax forms have the same origin as french. I know a little bit of latin, that often helps me understand both French and English. give birth to: she was delivered of her second child. ... just as "she was delivered of a son" means something slightly different, conceptually, from "a son was delivered to/by her", although in this one instance the two are almost always both correct. That is, "she was safely delivered" means "the process of delivery was done / happened to her" - and "of a son" refers to the process's reason or cause. Not the answer you're looking for? Browse other questions tagged grammar prepositions word-order passive-voice archaic or ask your own question. Has the use of these prepositions evolved? “It was a brilliant performance delivered in silence worthy of her name” — is this word order acceptable? Noun-adjective reversal - was it ever in use in plain speech? Can I use 'do' ('did') for emphasize main verb in phrase in passive voice?